Last week, my family (yes, all six of us-myself, wonderful hubby, 16-year-old Kath, 11-year-old MJ, and four-year-old twins Cupcake and Chunk) ventured to Florida for a vacation at Walt Disney World. While there were some moments I devoted exclusively to family fun, there were moments in line where if I wasn’t doing a head count that I would think about the plot of my next book or about posts for my blog. Everywhere I looked, there were rides or encounters that triggered my imagination about writing. Over the next four Mondays, I hope to share some of these writing tips with you. 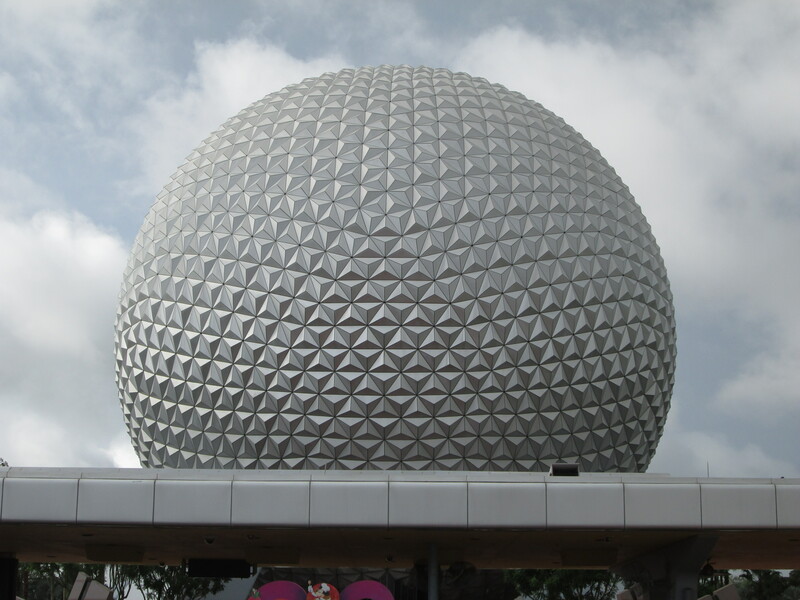 On Wednesday, we visited Epcot. Kath and WH (wonderful hubby) both love Epcot, rating it the best of the four main Disney World parks. There were three rides we went on two times: Test Track, Spaceship Earth and Journey Into Imagination with Figment. During both of the Journey into Imagination rides, I kept thinking how much this ride cries out to writers. For those unfamiliar with the ride, I’ll give a brief description. Eric Idle plays Dr. Nigel Channing, a scientist who is friends with a purple dragon named Figment. Dr. Channing appears on a screen to ask the riders to come along with him through his institute’s open house so they can get an idea of what type of research goes on at his institute. Figment takes over as the ride guides the passenger through the five senses of hearing, sight, touch, taste and smell. At the touch and taste portion, Dr. Channing reappears to say that wraps everything up with the ride when Figment reminds him of the purpose of imagination and takes the rider into his house where everything is upside down. Dr. Channing comes back to wrap up the ride having learned the importance of imagination when the screen floats upward to reveal a world where all the senses intertwine in a magical, imaginative area. So what does this have to do with writing? Everything. A book without a journey through the five senses would be flat. Writing needs to incorporate the five senses so the reader can live through the POV character. As a reader, I don’t just want details about what the writer is thinking all the time. I want vivid descriptions of how their world engages the POV character through all of the senses. Sight. If a book is set in a small town, I want to see what the POV character sees. Does she see a special festival? Farmland? Nearby lakes? What about the people? Are they tall? Short? Long hair? Clothing style? Tattoos? Distinguishing features? Different authors have excellent descriptive skills. I love the Anne of Green Gables series and L. M. Montgomery uses the sense of sight so the readers feels Anne’s depth when she sees the Lake of Shining Waters for the first time. Sound. If the book is set in the big city, I want to hear the noise of the city: the people, the stores, the transportation system, any construction, ambient noise, etc. Sarah MacLean did a good job of showing the sounds of foils when Callie and Gabriel fence in her book Nine Rules to Break When Romancing a Rake. Touch. No matter the genre, touch can still be utilized. The soft downy feel of a baby blanket? The hard cold steel of a revolver? The stiff spring sticking up from a sofa? How do they all feel to the characters? Does how something feel bring back memories or does it evoke emotion? Carolyn Hart does a great job with the sense of touch-from the feel of Agatha and Dorothy L., the cats of Annie and Max to the spines of the books Annie lovingly feels at her bookstore. Jill Shalvis, the author of steamy and fun contemporary romances, uses the sense of touch throughout her books from describing the relationship and beyond. Smell. This can be fun for a writer. During the ride, there are barrels marked with words that evoke wonderful smells like roses, cinnamon, and vanilla; however, Fidget warns the crowd that the smell he’s about to release isn’t one of those delicious smells. Instead, he lets loose with a not-so-pleasant smell. Depending on the genre, different writers can deepen what the POV character feels by utilizing smells. Mystery writers may write about the coppery odor of blood. Culinary mystery writers such as Katherine Hall Page may write about different recipes concocted in a kitchen. Romance writers may have different smells corresponding with the hero or heroine’s profession. Bakers may be around sugary and yeasty smells. Vets around dog dander and fur. Big animal vets such as Fair Haristeen, husband of Rita Mae Brown’s heroine Harry Haristeen, may be around horses and different stable scents. Even science fiction authors can research what astronauts have said about space and the moon. A spent gunpowder smell is the way Harrison “Jack” Schmitt described the moon’s smell. Smells are all around us, and readers want this element, too. Taste. The sense of taste can also enhance the reading experience. There’s a book by Robert Munsch called “M-m-m Cookies” where a boy makes play clay cookies and pranks his parents into eating them. They are not delicious, but Munsch evokes the sense of taste so you taste the play clay. In Diane Mott Davidson books, the reader gets to experience Goldy Schulz’ delicious culinary efforts when Goldy tastes small samples. Romance novels have different approaches to taste depending on the genre and heat level, but most heroes and heroines still taste a meal or a kiss or something that helps us go into their point of view. Kristan Higgins’ heroine of The Next Best Thing, Lucy Lang, is a bread baker and the hero, Ethan Mirabelli, hails from Italian parents who own a restaurant. Needless to say, lots of yummy bread and lots of yummy pasta scenes. In your work in progress, do you explore the five senses? It will help show what your characters are experiencing. Thanks to Journey into Imagination with Figment for making me think more about the five senses as applied to writing. Who are some of your favorite authors who use the different senses? Let me know. Next Next post: Reading Wednesday: Audiobooks, anyone?